Spain had been on my wishlist for a while before we booked our summer holiday there for the beginning of July. My only previous experience with Spain was a long weekend in Barcelona ten years ago when I really struggled to find vegetarian options, and I was confident I could improve on that this time around: I’ve seen a lot about how vegan-friendly the main cities in Spain are. Sure enough, we ate very well as we spent two weeks travelling from Madrid to Valencia and finally Barcelona. These are good places for vegans. In fact, our only problems with food came from the opening times. As a person who thrives on a regular eating schedule of breakfast at 7am, lunch before 1pm and dinner by 6:30pm at the very latest, I was not very encouraged by Spanish opening times. Even when I thought I’d found a winner (“Oooh, this place is open from 11am! Let’s book lunch for 12pm!”), I was swiftly disappointed (“We serve breakfast 11am-1:30pm, lunch 1:30-3pm.”). Eventually we managed to get into a rhythm, and I don’t think I let my hanger get the better of me, though Dr HH might disagree. 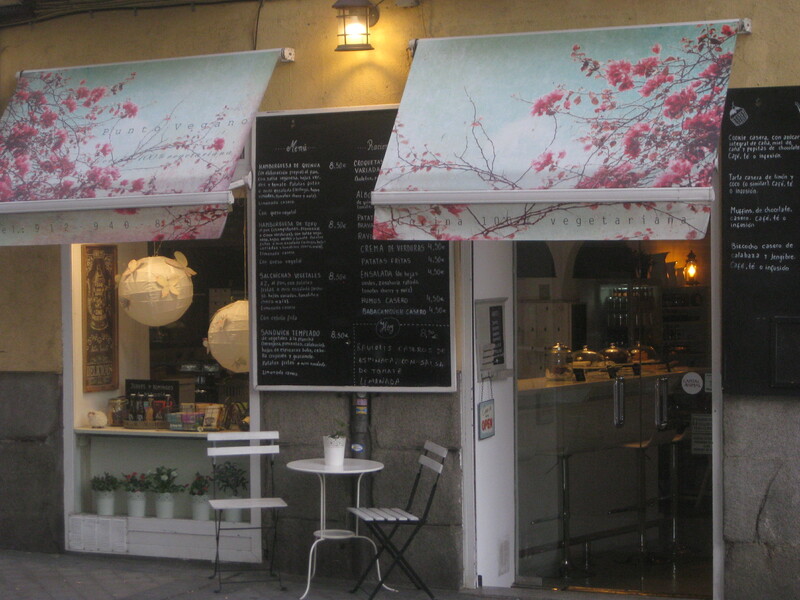 My top tips for eating in Madrid are to always make a reservation, and to go for set lunch menus where possible. Almost every eatery we visited in Madrid was constantly jam-packed, which is great news for the thriving vegan businesses, but bad news for hungry tourists. I made all my reservations on Facebook, no clumsy telephone attempts at Spanish required. And the three course lunch menus were very good value for money, and helped to keep me going until my next feeding at 8pm. 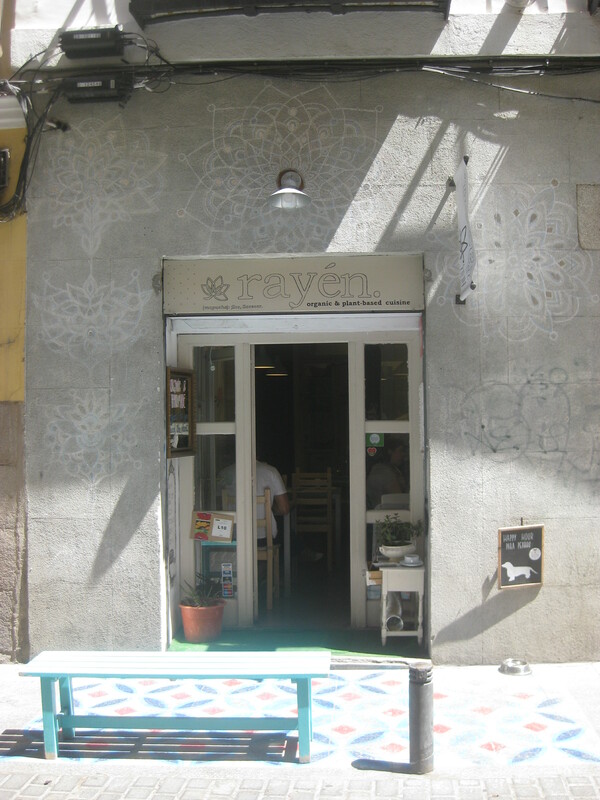 On our first day we went for a 12pm “breakfast” at Rayen Vegano. It’s a lovely, charming place: really attractive, but quiet small and you really need to book. There were English menus, and the staff spoke perfect English too, so it’s very tourist-friendly. In fact, I’d call this a must-visit if you’re in the city. Dr HH ordered the Sunday special of three buckwheat pancakes, which were good and thick. 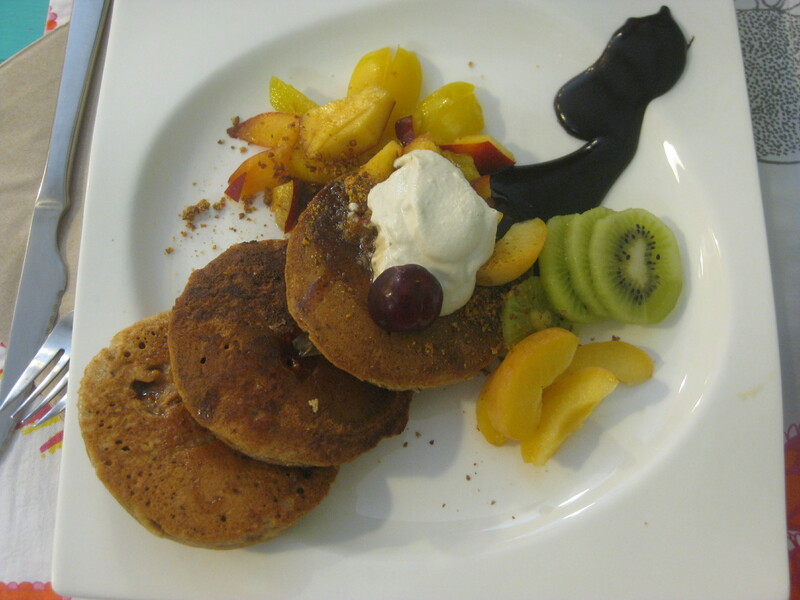 They were topped with a really good cream and some fruits, and served with amazingly thick chocolate sauce. He was delighted with this, unsurprisingly. 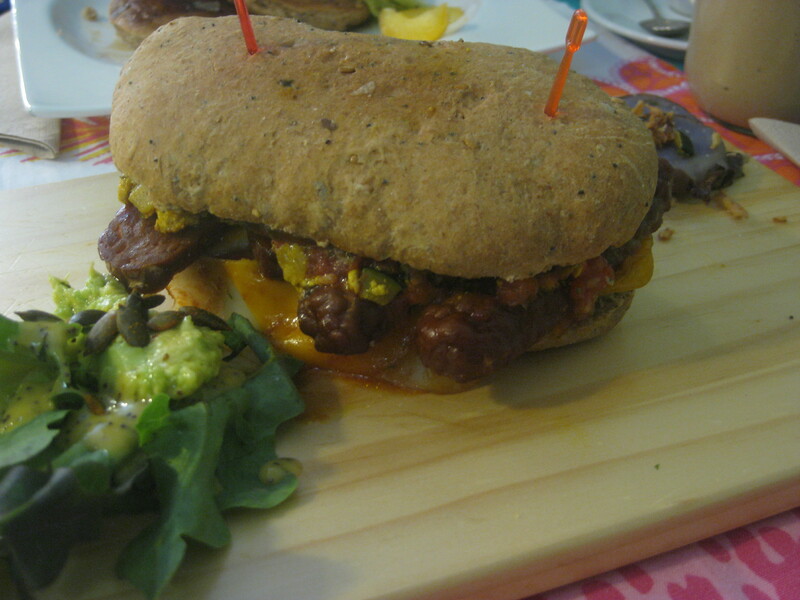 I couldn’t resist the tempeh sandwich, though I usually favour something sweet. This is a regular feature on the breakfast menu, and I can’t praise it highly enough – and I say this as someone who generally hates sandwiches! First of all, the homemade bread was delicious. It was filled with tomato, lots of tempeh bacon fingers, cheese slices, tofu scramble and a really good sauce. I couldn’t pick the whole thing up, it was so substantial! The accompaniments (purple potatoes with crispy bits and a mustardy salad with avocado) were also delicious. What a feast! 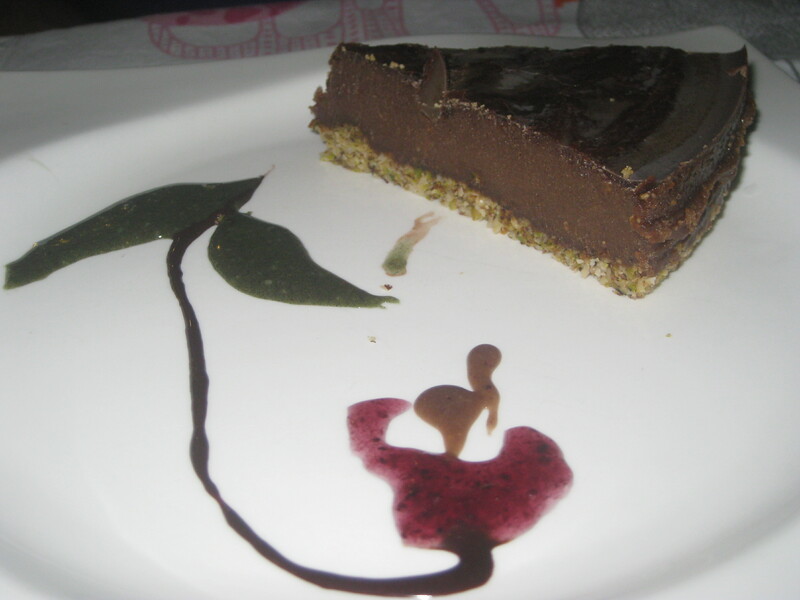 As it had gone so well, we decided to treat ourselves to a slice of raw peanut butter cake for dessert. It was exactly as a peanut butter cake should be: sticky and gooey, with a good crunchy base. Alas, we didn’t realise until the bill arrived that it cost €6.50. It was a good cake, but that’s still a pretty high cost. Even so, we left on a high. Late that night (at 8pm on the dot) we arrived at Punto Vegano for our first tapas of the trip. 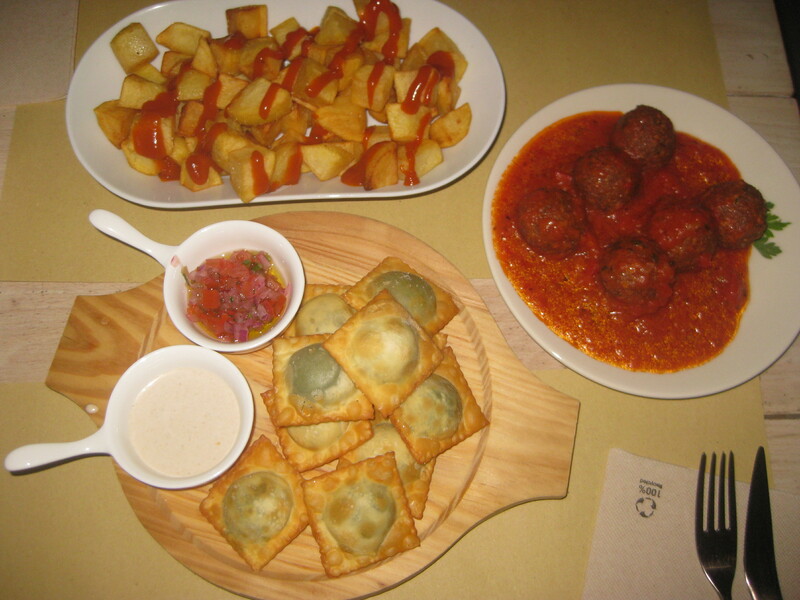 It also serves main courses, but we were eager to get into the spirit with some tapas. Again, booking is recommended for this small and charming little place. There are English menus and friendly staff. It’s a stone’s throw from the Temple de Bod, a little Egyptian temple relocated to Madrid and a nice spot to catch the sunset. We ordered three dishes to start. Of course, we had some patatas bravas. The little cubes of tomato were perfectly crispy, and the fiery sauce was only drizzled on, so it was quite easy to control the spiciness (you can also order the non-spicy sauce). We added a squeeze of alioli, which was lovely and garlicky. The fried ravioli sounded and looked so inviting. They were lovely and crispy, but the filling was only spinach, which was a little bland. Some tofu or mushrooms would have livened it up a bit for the palate. The quinoa and oat meatballs in tomato sauce are also available as a main, and they were remarkable! They had so much flavour. To make sure we were completely full, we finished off with some babaganoush. 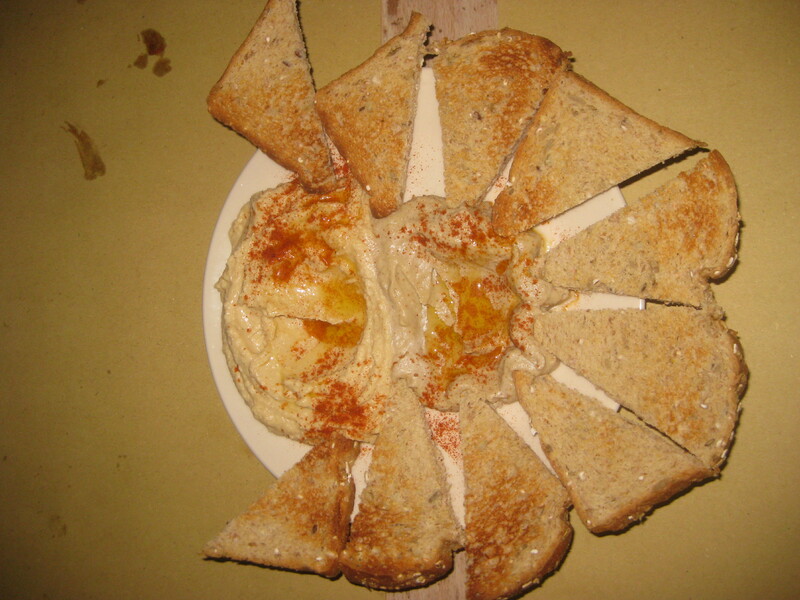 We got a mixed plate with some hummus, as they were almost out of the aubergine dip, and both were really tasty. The bread was good too, and we were definitely full by the end. 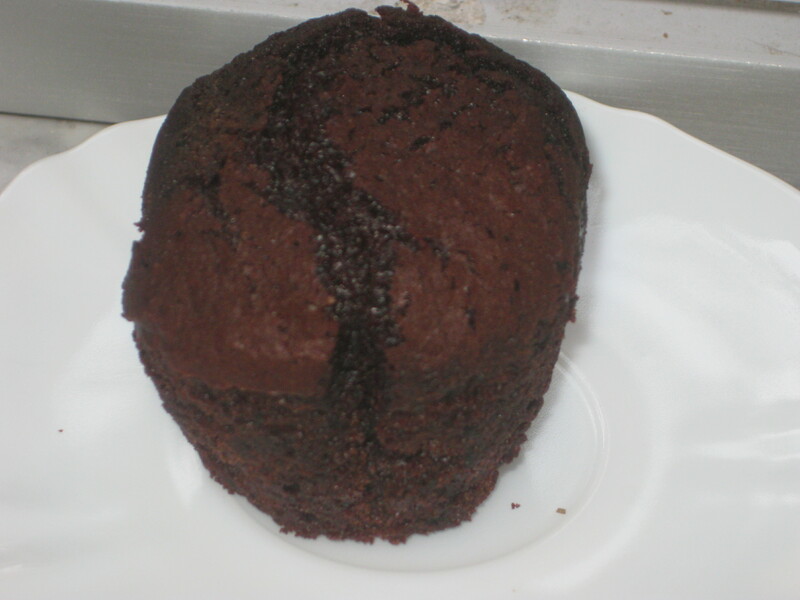 We also got a couple of chocolate muffins to take away for breakfast the next day. They were a bit decadent for the morning, but they were really good! On Monday we were back to Rayen Vegano for the lunch set menu. As I said, these are such a great deal. It was €11.50 for three courses plus bread and a ginger kombucha drink (tap water was also available for free, which is always a bonus in Europe). There were two options for each course, and the waitress recommended choosing one of each to share. Alas, one of the options for the starter was a melon and cucumber gazpacho. Melon and cucumber are two of my most-hated foods, so we didn’t bother with that – we both had the carrot and mushroom salad. 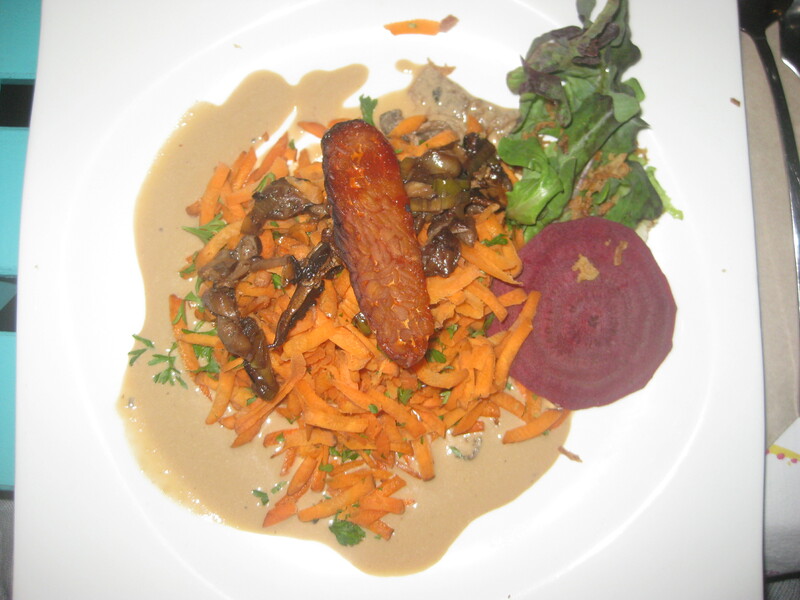 It was a simple salad that was elevated by an earthy mushroom sauce and a tasty tempeh slice on top. 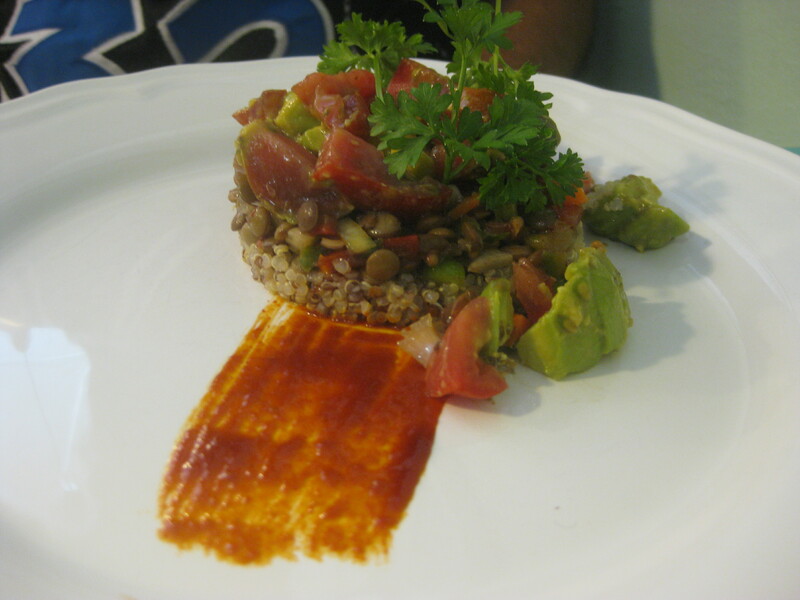 One of the mains was a timbale of quinoa, avocado and fiery salsa. It was summery and fresh, but not particularly filling – especially in comparison to the other option. 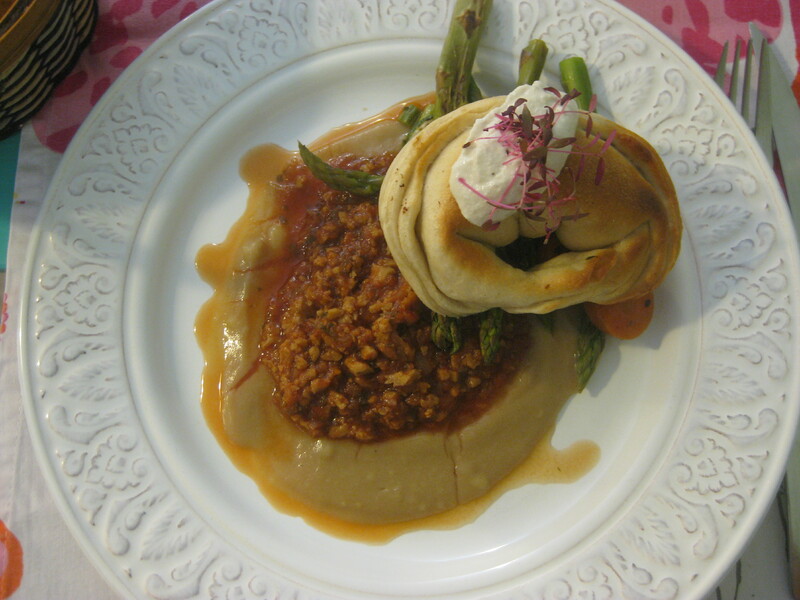 The seitan pasty on mashed potato and tomato sauce was delicious, with some pesto vegetables too. 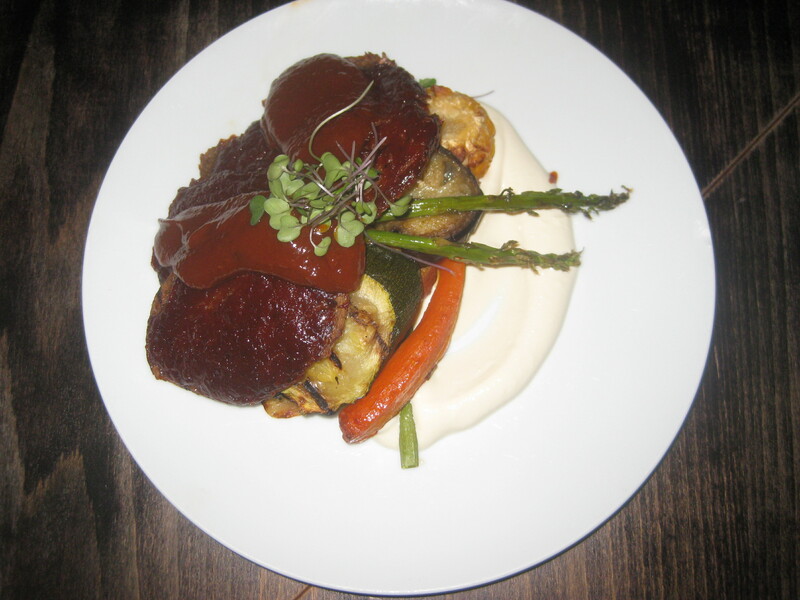 It was very filling and there was good depth of flavour in the sauce. 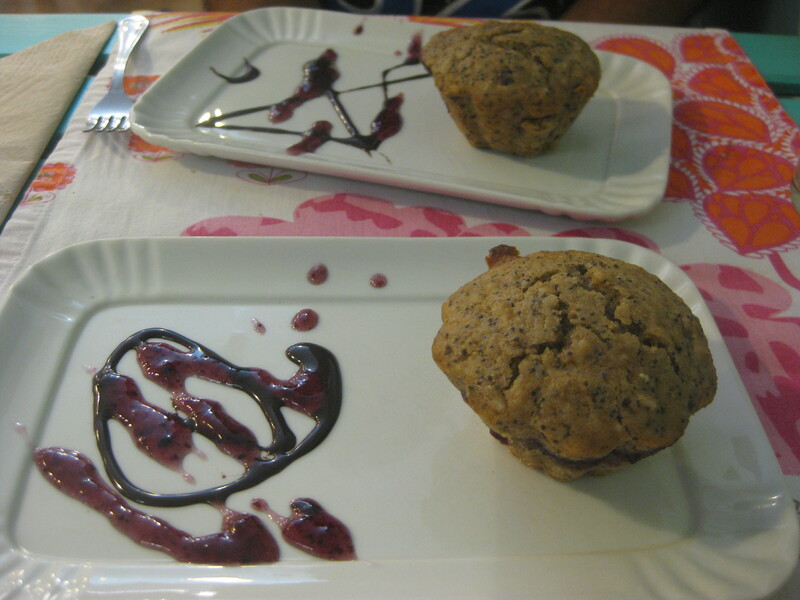 The dessert options were a little disappointing: a coconut muffin, or a coffee one. Still, the presentation made it look somewhat fancier, and the coconut cake was moist and lovely. Vega was our next stop. All the reviews on Happy Cow are positive – except from people who were turned away. Yes, booking is necessary: it’s small and popular. Even though we booked, the service wasn’t great. After 15 minutes nobody had taken our drinks order, and then it took another 30 minutes for our food to arrive. Still, it was a nice, rustic place, and all vegan, so there is hope. We considered tapas again, but decided to get some mains instead. 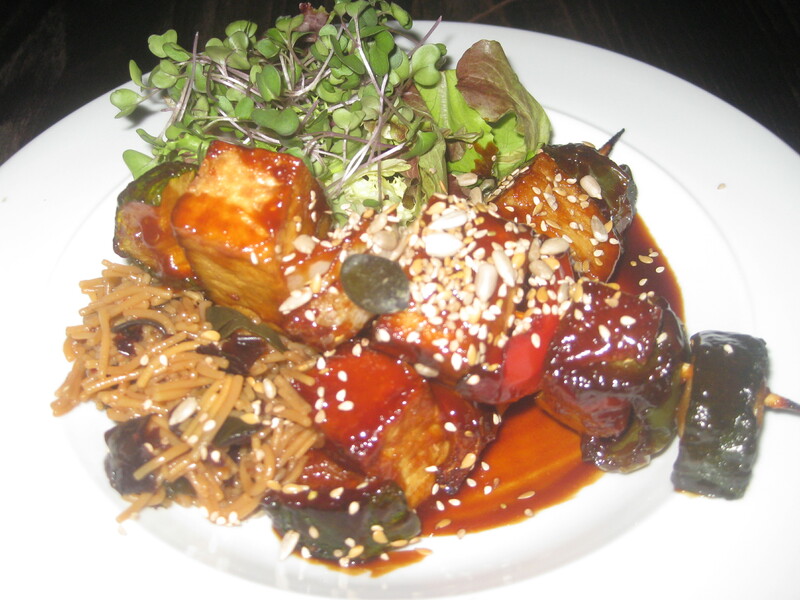 I got the brochette of smoky tofu, which had a lovely sticky, sweet marinade and crunchy sesame seeds. The vegetables and glass noodles were tasty and filling, though the salad leaves were not dressed, which is a shame. Dr HH was quite disappointed by his barbecued seitan with grilled vegetables. The seitan was cut into really thin slivers, which isn’t great when the chunky, meaty texture is always the highlight. The sauce was a little too sweet, but the chunks of vegetables were good. It was the first underwhelming meal of the holiday, both in terms of food and service, but I suppose you can’t win them all! It was still nice, but not on the same level as our other excellent meals. 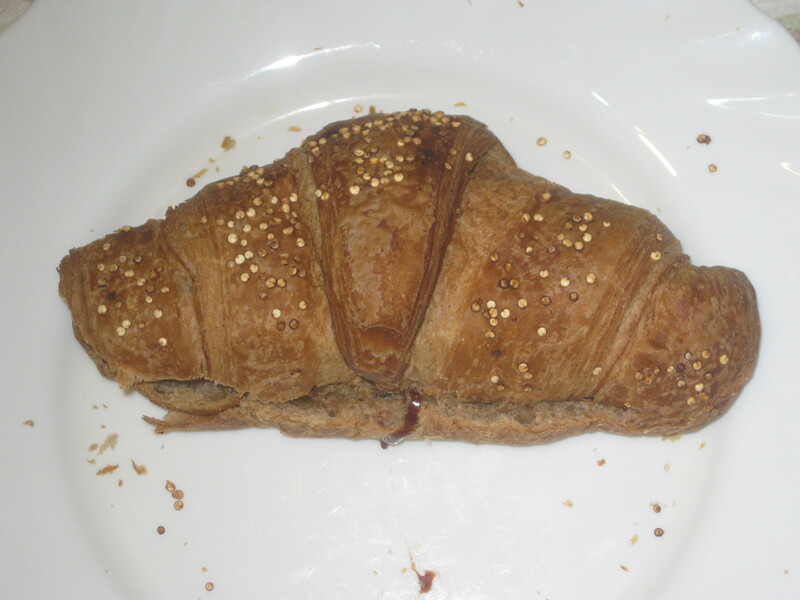 We had breakfast croissants a couple of times while we were in Madrid, once from Le Pain Quotidien and once from La Rollerie. They look pretty similar above – I expected both places to bake their own goods, but who knows if they share a supplier? They were both a little flaky outside, but quite bready inside. Still, they were nice. 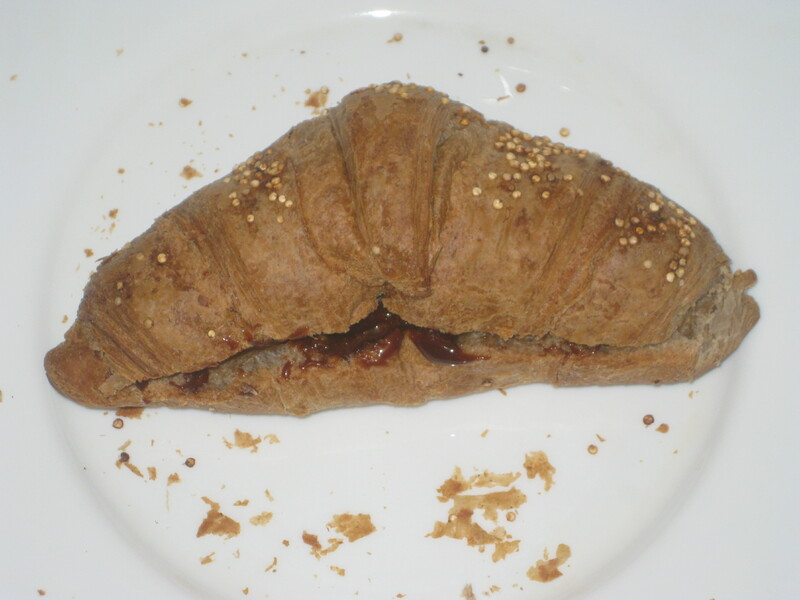 In both places you can get the croissant to eat in or take away. Le Pain Quotidien has a couple of vegan options on the menu, and four muffins labelled vegan, so it’s a great spot to pick up snacks. 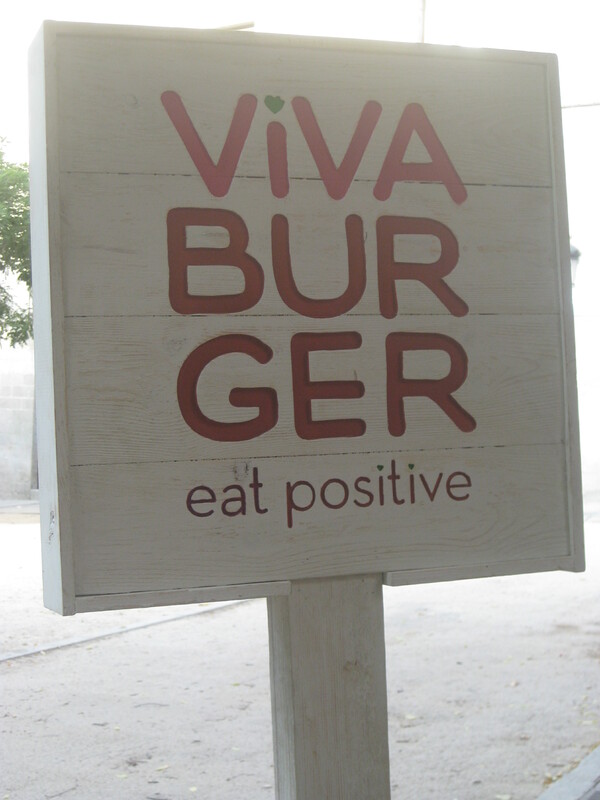 We got our burger fix at Viva Burger, which is a fun 100% vegan restaurant which specialises in, surprise surprise, burgers. There’s an outdoor terrace in a nice square, so you can feel like quite the European – however, there’s a 10% surcharge for dining out there. We did so anyway. It was extremely popular, and initially there was only one server so things were a little slow. It picked up eventually though. 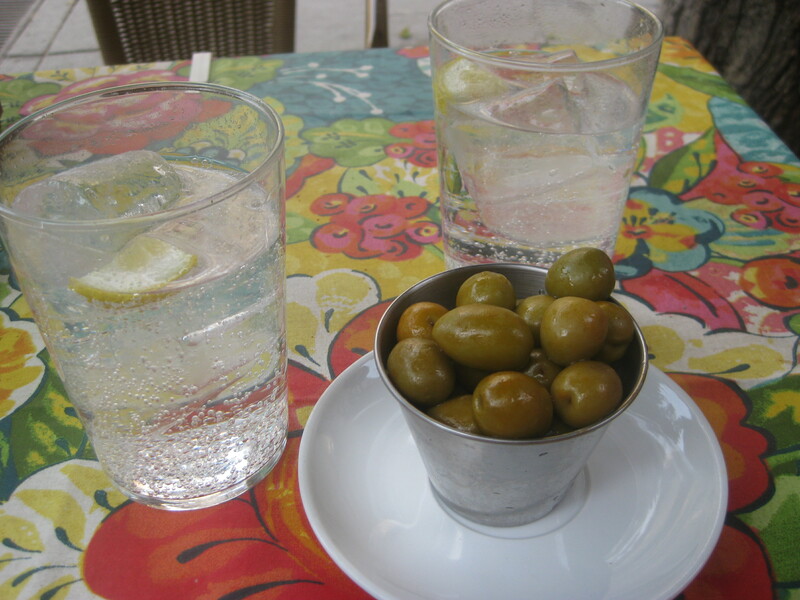 This place was the first in Madrid that gave us complementary olives while we waited: hurray! I ordered the ahumada burger, which promised smoked cheese and sundried tomatoes. 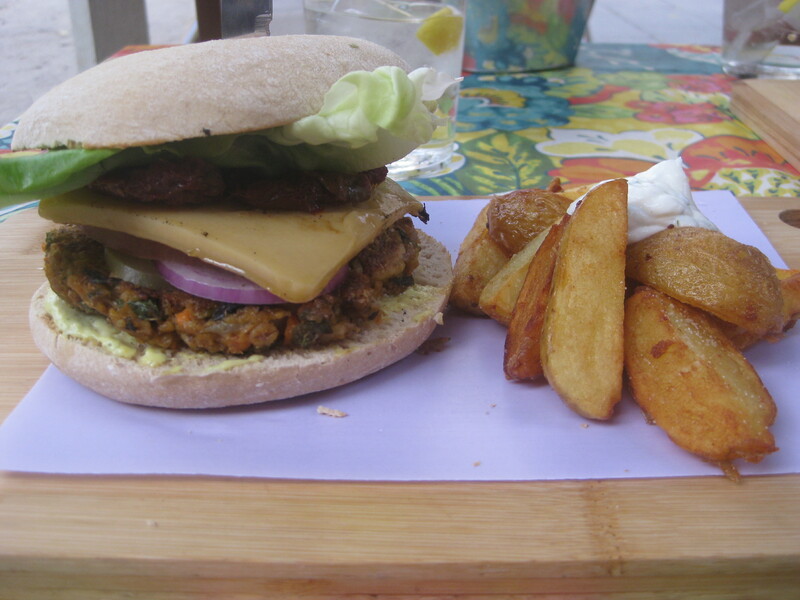 The patty was good and vegetable-based, but the highlight was the cheese – a really thick slab of it, simply delicious. It was very good, but I couldn’t actually finish it, it was so immense. Dr HH had no such problems. He enjoyed his chingona burger, which had the same patty topped with avocado and pico de gallo. He enjoyed the spiciness and thought the whole thing was packed with flavour. Alas, it lacked some structural integrity – the avocado should have been sliced, rather than cut into big chunks which couldn’t be held in place or squashed down for easy devouring. Both burgers came with amazing crispy potato wedges. I ate all of those, no problem! Our last meal in Madrid was definitely one of the best, and probably our best tapas in the whole of Spain. We went to B13, which serves both tapas and mains and is quite a cheap and cheerful place with no table service and no reservations. We were there about 5 minutes after opening at 8:30pm, and within half an hour it was absolutely packed. 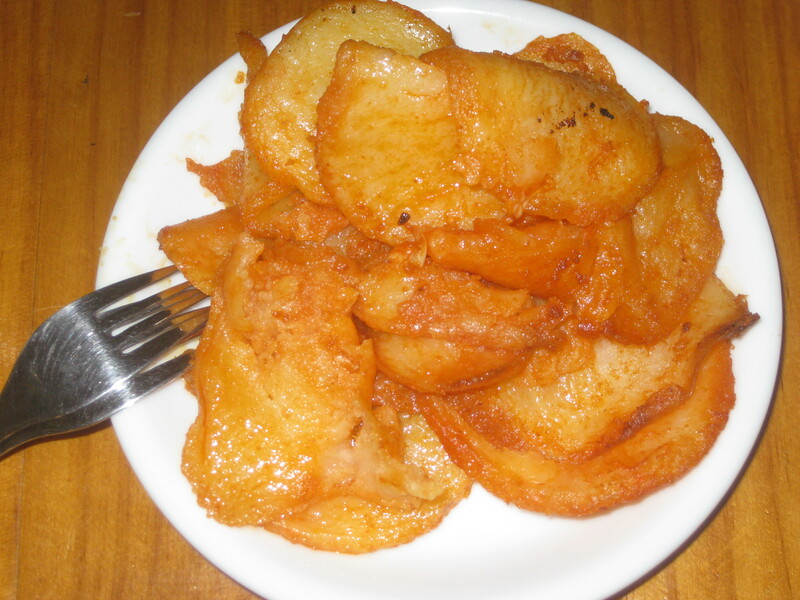 Happily, we got some fried potato slices while we waited and agonised over the menu. I was really excited about trying the calamares, something neither of us had ever eaten in our omnivore days. They were rings of lightly battered tofu with a slight taste of the sea, which I guess is from seaweed. The batter was perfect, and they were delicious, though I can’t comment on their authenticity. 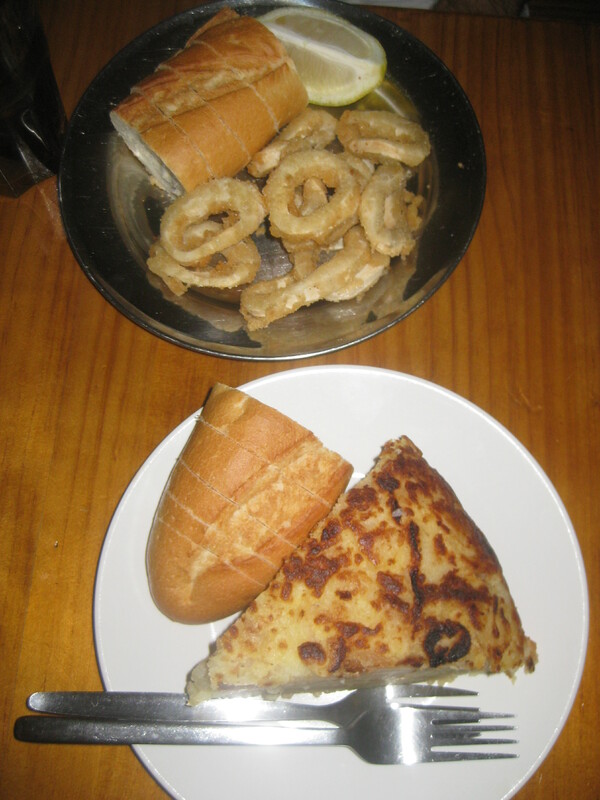 The onion rings were less impressive – the batter wasn’t as good as that on the calamares, and they seemed to be made from mushed onion rather than actual rings. They came with a tasty BBQ sauce which livened them up a bit. We gambled on something called San Jacobs of seitan and cheese. 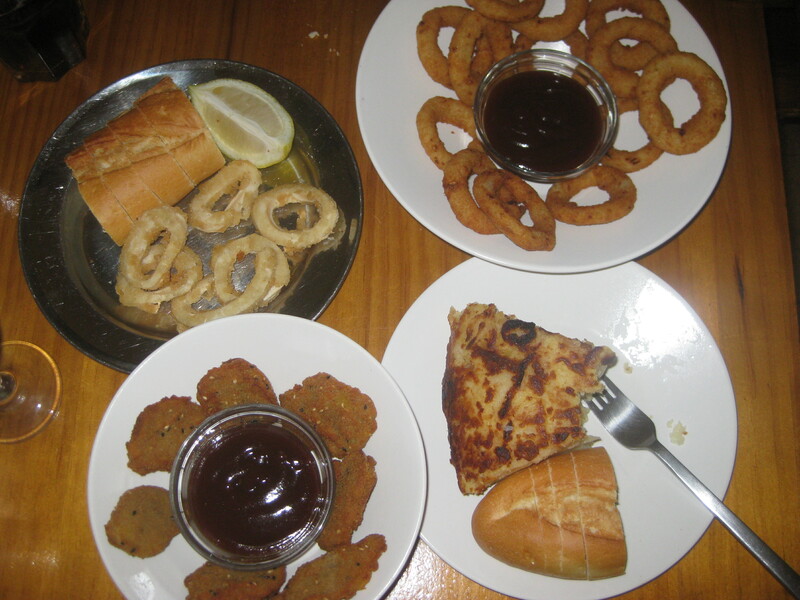 They were basically breadcrumbed nuggets comprised of two thin slices of seitan sandwiched with gooey cheese, and served with more of that BBQ dip (there were four options). Sounds good, no? They were excellent. And, saving the best for last, we had this potato omelette. It was huge! It was also very tasty. This was our first taste of tortilla, and it was very good indeed, you must try it if you visit. 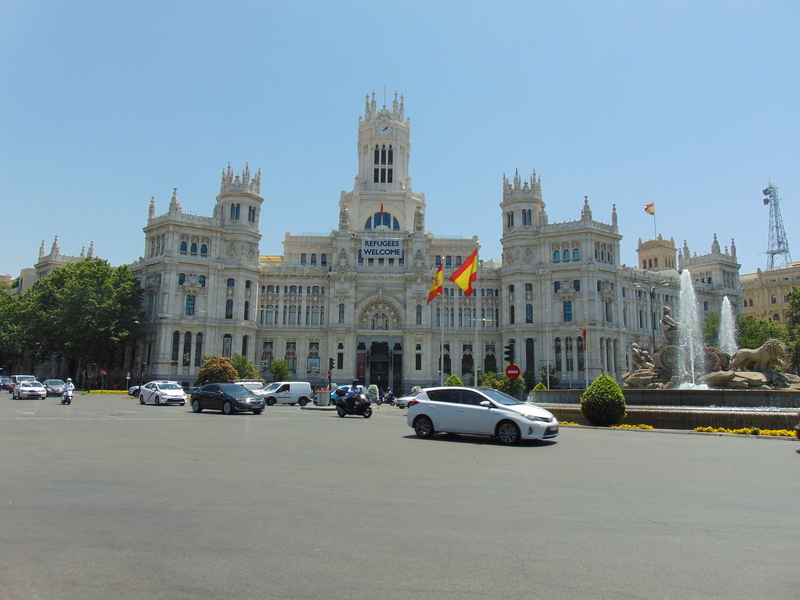 Madrid was a great destination, both as a vegan and as a tourist. 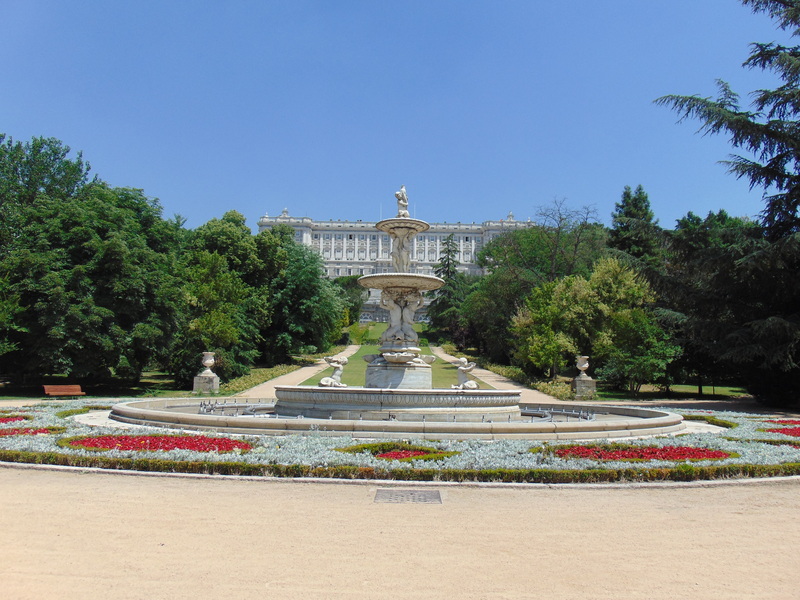 We enjoyed the greenery in the city, especially El Retiro park in the city centre and the gardens around the palace. There were also lots of grand buildings to admire, including the palace itself, the cathedral and this rather famous one. There is no shortage of good art in Madrid either. 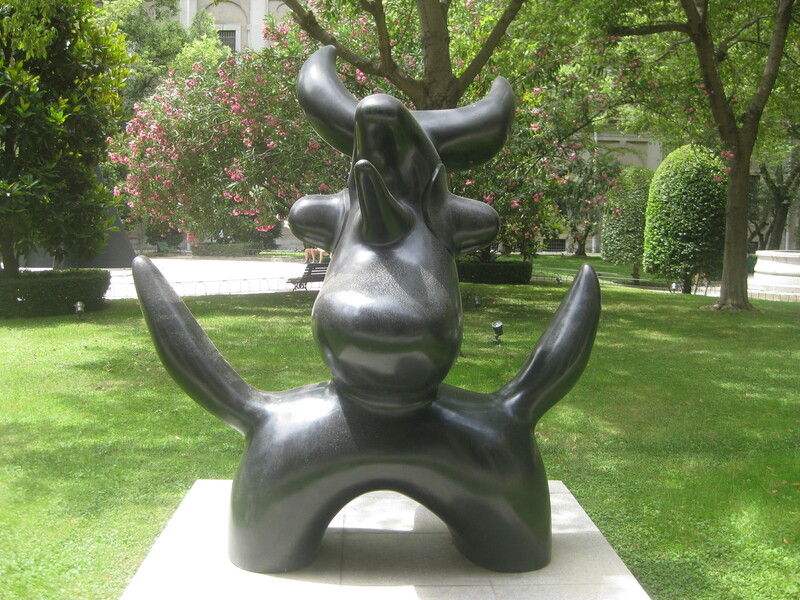 The Prado is possibly the most famous, but we didn’t go there – we went to the Reina Sofia and Museo Thyssen-Bornemisza instead (both have free opening hours, so take a look if you want to save some pennies). Those two have more of the impressionists, which is what we generally keep an eye out for. And there’s street art aplenty too. 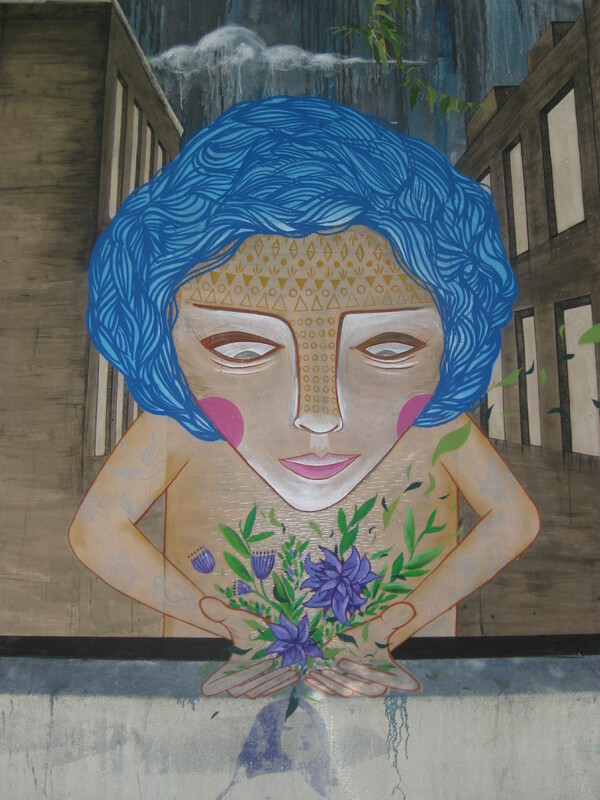 We went on a street art tour and saw some impressive works around the city centre. The walls around the Tabaclera were one of the best spots, with lots of colourful pictures to admire. 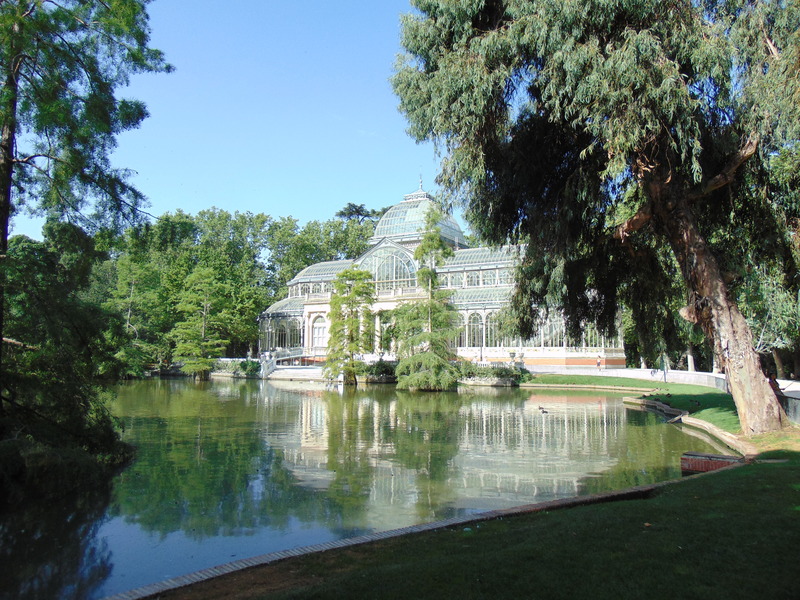 Whatever you’re into, and however hungry you are, Madrid will keep you happy! 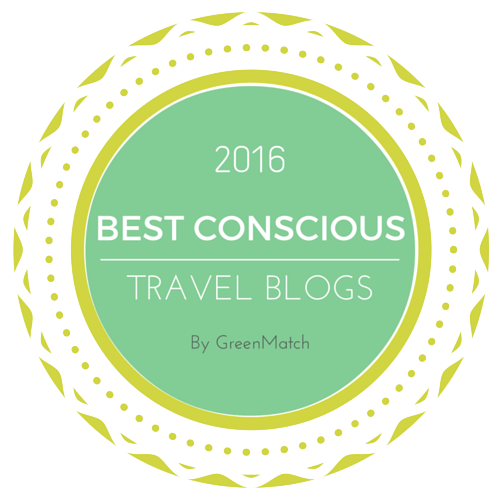 This entry was posted in Travel and tagged B13 Madrid, Punto Vegano Madrid, Rayen Vegano Madrid, Vega Madrid, vegan Madrid, vegan travel, Viva Burger Madrid. Bookmark the permalink. I just got off the phone with my friend who complained a little about the vegetarian food selection in Spain. Granted she was traveling with other people who made most of the planning, and she is a flexitarian. It was funny to see all the reviews of the restaurants. Oh man! Vegan calimari/calimares! I use to love squid, but it isn’t a popular food in the states so there aren’t many vegan options here. I’ve never seen vegan calimari anywhere else either – I was really excited about trying it! It’s a shame about your friend’s experience. Was she in the big cities? I imagine it’s harder finding meat-free options in smaller towns. She was in a big city, but she was more so a guest traveling with a family. So I think a lot of her limitations were from the family she was traveling with. I visited Madrid a few years back and remember how much I loved the food there, above all things. Now I remember why! Interesting that we didn’t visit any of the same food places – I hope that means that there’s twice as many options rather than some have shut down. Such a cool place. That is interesting! 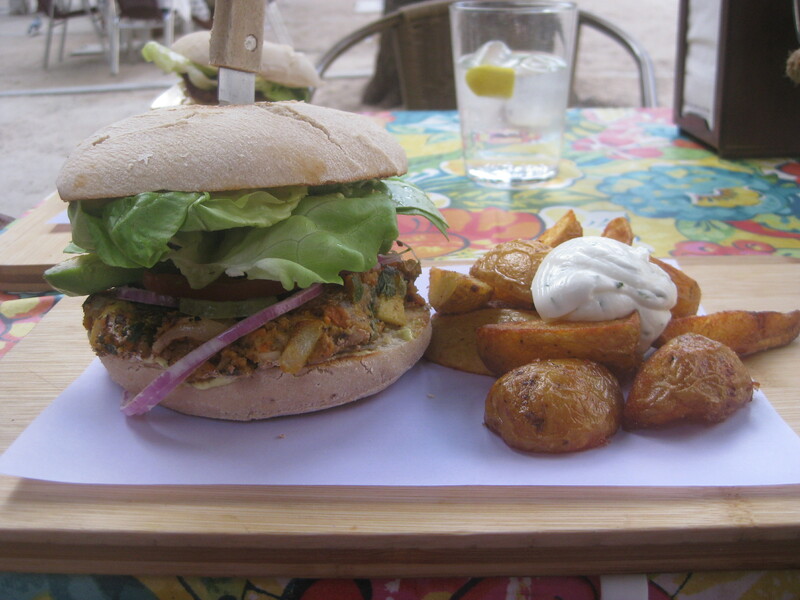 Almost everywhere we visited was 100% vegan, so I guess they might be a bit newer as the vegan scene has grown. There were a lot of listings on Happy Cow, so I imagine it would be easy to go again and visit completely different places. I love it when that’s the case! 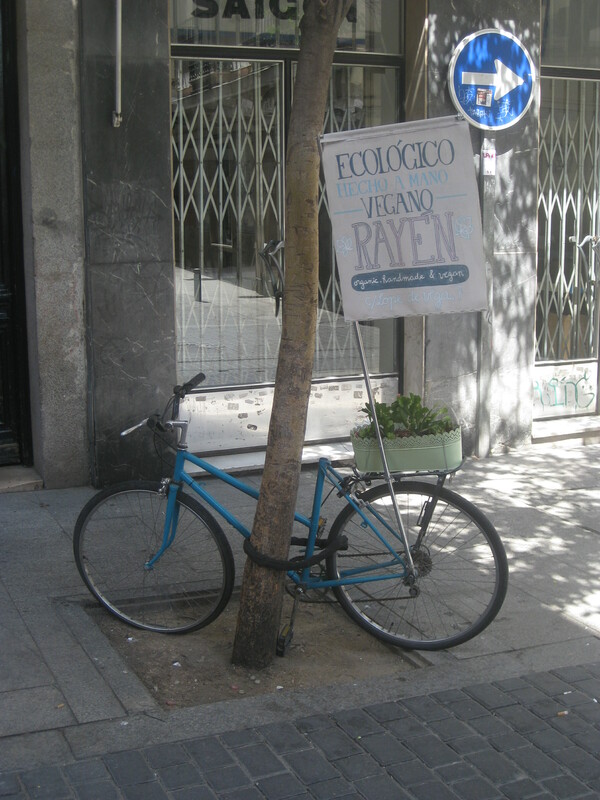 Wow, I am amazed to see that there are such great vegan options in Madrid. I knew that Barcelona was getting pretty good these days but I hadn’t heard of anywhere else. I love reading about your travels. I’ve found that most big European cities have a thriving vegan scene – it’s really encouraging to see! I loved the fact that everywhere was so busy too. There’s clearly enough demand.